“The soothing repetition of the text’s beginning and end and the charming warmth of Dufft’s watercolour and pencil illustrations should make this a storytime staple within the home. In fact, I can’t emphasize how lovely Dufft’s artwork is bringing to mind the styles of Tomie dePaola, Maurice Sendak, Janet Ahlberg, and Shirley Hughes, but with a sensibility and sweetness that’s all her own. The book as a physical object is also comforting, with padded covers, and endpapers featuring a star-studded sky, all thoughtful elements that create a perfect lap book for bedtime…. 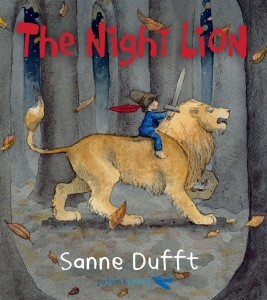 Hopefully, The Night Lion will be the first of many picture books to come from Dufft. Pair The Night Lion with another bedtime read aloud, Jane Whittingham’s Wild One (featuring a female protagonist)…and you’ll have a wonderful bedtime routine down for the under-threes age group.